Olympia Time: Read David Scherer Water's "Olympia"
Read David Scherer Water's "Olympia"
There are a few books about Olympia that I'd say were necessary to own. To be honest, most of the stuff written about Olympia is pretty bad. Either poorly written, poorly researched or just repetitive, not hoeing new ground. Rogues, Buffoons and Statesmen is on that list, not because it is entirely accurate, but because it is expansive. Confederacy of Ambition is also on that list because it is insanely well researched. You can buy Olympia at BuyOlympia.com (which is based in Portland). Olympia by David Scherer Water is also on that list. Not because it is entirely accurate, it really isn't. It is mostly, strictly speaking, inaccurate. But, in the way that smaller details give way to larger truths, it is the most accurate book about the city we live in today. Zach Mandeville's zine series Funwater Awesome was as close a true (but not really true) capturing of what is is like to live here nowadays. 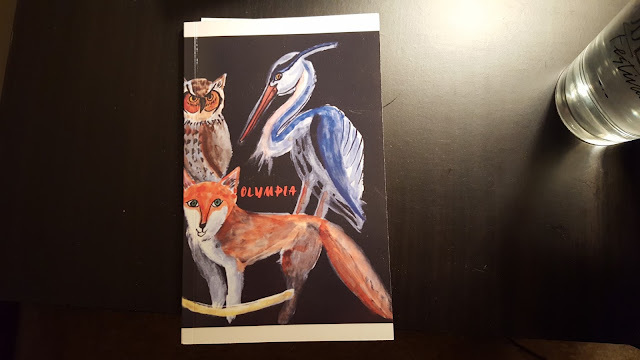 "Olympia" is a thin volume, it won't take you too long to get through it. But, because the truths are so large and so well presented, I've had to backtrack and slowly take the entire book in. Visitors, especially ones from cities with "bad" crime statistics have noticed Olympia's "good" crime statistics mask a difficult to gauge social unsafety. "I should feel safe here, but somehow this place feels terrifying. Why is that?" These are true things about Olympia, but usually they're put out by five or ten year residents that finally got tired of being polite about one aspect of the way we live here and are just reduced to being whiney. David, an Olympian of 25 years, spells them out with calm and without judgement (seemingly) and at times tries to dig down to or origins. But then there is the Holy Sh*t Park. I'm not going to say any more, other than to say that every one of us is blind. David is the only one that can see. I'm too far gone, and most everyone I know is as well. David sees reality in the case of this park. Just read the book, you'll see what I mean. I don't want to go over it too much, David will lose his patience.